4 things you should know about St. Patrick’s Day | Where's my backpack? It’s that time of year when green tinsel starts to sprout mysteriously from local taverns and oversized green hats emblazoned with shamrocks fill the shelves of the local deli. Saint Patrick’s Day is almost upon us, and it is enough to strike dread into my otherwise carefree heart. It all began when I was representing my school house in an inter-house quiz. Starting everyone off with easy questions, the first pupil was asked what date Christmas Day was. I stood like a deer in the headlights, because I had this horrible feeling that they’d ask me what day St. Patrick’s Day fell on. I could never remember; to me it was just this vague day when it almost always rained (in Ireland, that doesn’t really narrow things down all that much) and we didn’t have to go to school. My mum told me later that, as she was sitting in the audience, she had the exact same premonition. Laughter. “Well, the month does begin with an m…” the teacher acting as question master tried to help as best he could. “March” – yes, I was halfway there. A good round number ought to do it. “15th“, I said, definitively. I made up for it with a blinding second round, and our school house ended up winning, but nothing could remove the memory of that traumatic first question. 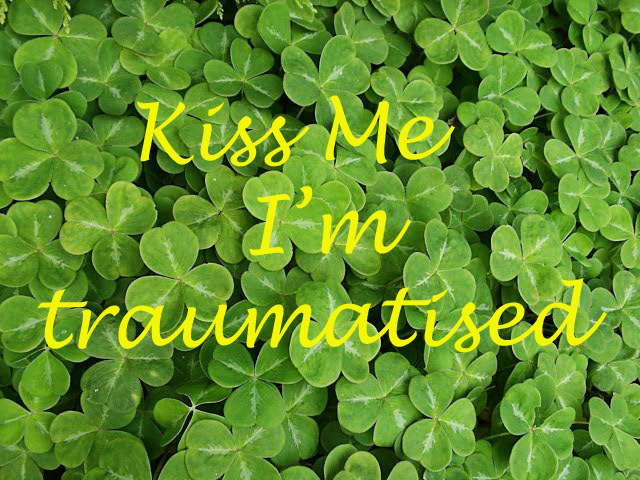 The trauma associated with St. Patrick’s Day has only increased over the years since I left school, because I’ve spent many St. Patrick’s Days overseas, bewildered by the misconceptions associated with this holiday. So this year, I have decided to share 4 important pieces of information. Bagpipes sound great and men in kilts are fantastic (right ladies? ), but they are not Irish; they’re Scottish. Uilleann pipes are Irish, and they’re quite different to bagpipes. They have a sweeter, quieter sound than the Highland Bagpipes people usually refer to as bagpipes. Uilleann pipes are made to be played sitting down, unlike bagpipes which are played standing up, often on parade. Uilleann pipes are traditionally a social instrument; bagpipes are traditionally a military instrument. Kilts originated in the Scottish Highlands around the mid 1500s, made from tartans representing different clans. While they may today be seen as representative of the entire Celtic culture, Irish tartans are a modern invention and there is no evidence of kilt-wearing in the Ireland of yore. Not that I’m complaining about kilt-wearing being on the increase, and I believe that utilikilts are the best thing that’s happened to men’s fashion in ages. Craft, time-honoured tradition and love have gone into the brewing of a pint; don’t mess with it. Unless it’s Budweiser, which I’m not entirely sure counts as beer, in which case you can do whatever you like with it. Put green dye in an Irish person’s beer and you are liable to end up face down behind the bar with a pint of green beer reaching places you never knew you had. It would never cross my mind to wear green on St. Patrick’s Day. If anything, I’d probably try to avoid it. I was quite startled the first time someone pinched me for not wearing green. It’s a good job I’m a nice person at heart, because in all fairness, if you try to pinch an Irish person for not wearing green on St. Patrick’s Day, you should really suffer a fate similar to the one you would incur by putting green dye in beer. See point 2 above. The Irish abbreviation of the boy’s name ‘Patrick’ is either ‘Pat’ or ‘Paddy’. ‘Patty’ or ‘Pattie’, on the other hand, is the abbreviation of the girl’s name Patricia. St Patty’s Day is either a revolutionary suggestion that our patron saint was actually a woman, or at some point in history a hamburger was elevated to sainthood and is now celebrated worldwide on the same day the Irish celebrate Paddy’s Day. Armed with this information, let me wish you a safe and happy Lá Fhéile Pádraig. This entry was posted in Ireland, Travel, United States and tagged blogging, culture, holidays, humor, ireland, irish, life, postaday, st patrick's day, travel, writing. Bookmark the permalink. The late, lamented H & H bagels on Broadway & 80th St. used to sell green bagels on St Paddy’s Day. Don’t hit me, I’m (half) Irish! I can’t believe that it lands on a Saturday. I am dreading the day and the aftermath of drunken puking B&T peops and will do my best to be away from Hell’s kitchen as much as possible. Theater in Dumbo anyone? Lol, great piece! I didn’t know Christmas had the same date until graduating college (they never covered that in Hebrew school) What’s your take on baking green cookies for Paddy’s day? It’s all about marketing – all the decorations are in the stores. ( please put down that green beer – it’s gross…like green eggs). Perfect post! Begorrah, thanks very much. Sappy day right back, hiccup! I remember the awful day when my sister couldn’t remember the date of Paddy’s Day… the enduring shame is one of the reasons we left Ireland. Ailsa is right about the Uilleann pipes – another difference between them and the bagpipes is that you can easily down a pint while playing the Uilleann pipes… damned difficult with those pesky bagpipes. In Chicago they dye the river and the beer green on St. Patrick’s Day. Oh my, that is just not right! Is it a pretty big day in Chicago too? I often hear Irish people laugh or complain that Americans make a bigger deal out of St. Patrick’s Day than is done in Ireland, have different and more flamboyant customs in celebrating it (e.g. wearing green), and so forth. What they don’t seem to realize is the fact that the historical background and consequent significance of the celebration is entirely different here. It’s easy to forget that the Irish were highly discriminated against in America especially during the late 19th and early 20th C (barred from working certain jobs, living in certain flats, etc.). Obviously, this would not have been the case in Ireland itself. Yes, note to future travellers: you might end up bringing one home with you. I used to have trouble remembering the date of Paddy’s Day as well (although less traumatic for a Kiwi girl I imagine). My grandfather (who was Irish) died on Paddy’s Day though, so now I can remember it. It makes the day a little more special – but also somewhat sad. Bavaria 🙂 In fairness I’ve spotted a good few Irish pubs alright, so I shouldn’t feel too far from home!